The Chuwi HiBox is one of the best entry-level Windows TV boxes out there. The combination of a newer Atom CPU, 64GB storage, 4GB of RAM and a non-registered Windows make it a firm favourite of ours. Of late, there’s been a surge in affordable, pint or palm-sized computers which a lot of businesses prefer to laptops because they can be left on their own in a corner without requiring much attention. The Chuwi HiBox is the latest member of this particular club, and one which comes with a couple of interesting features that separate it from the rest of the competition. It costs as little as £112 (about $140, AU$180) direct from Gearbest or £123 (about $155, AU$200) at Geekbuying, two of the biggest online retailers focusing on technology in China. Chuwi provided us with the review sample. The HiBox is barely bigger than a couple of CD boxes put together and at 120 x 120 x 25mm, the device is tiny enough to fit almost anywhere. It still manages to pack three USB ports (one of which is USB 3.0), a full-size SD card reader, a Gigabit LAN port, an audio connector and an HDMI port. 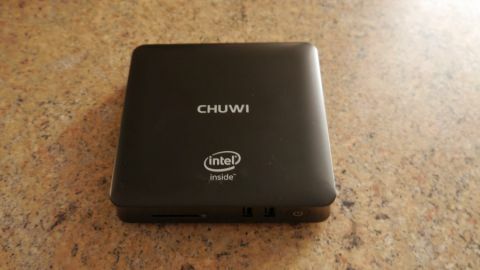 This Chuwi PC comes with a bracket to fix it to the back of a VESA-compatible display as well as an HDMI cable, a 2.4GHz Air Mouse remote control (with a USB receiver) and a 24W (12V, 2A) power supply unit that plugs into a proprietary connector. Other than the Chuwi name, four rubber feet and the ubiquitous Intel Inside logo, there aren’t any other notable features on the outside. Oh, there are two tiny holes on one side of the device which could be mistaken for microphones; Chuwi confirmed that the device doesn’t contain any mics. It is inside, however, where the HiBox manages to impress by being the only device to offer a Z8350 processor and 802.11ac Wi-Fi. The former has a slightly higher turbo clock speed compared to the more ubiquitous Z8300 Atom CPU. Otherwise, these two Atom processors are remarkably similar, although it should be noted that the Z8350, which was released nearly a year later, is likely to have enjoyed a number of tweaks and improvements in the manufacturing process. 802.11ac is a welcome addition to boost download speeds – you also get Bluetooth 4.0, 4GB of system memory and 64GB on-board eMMC-based storage. The other big difference compared to the competition is the ability to dual boot to Windows 10 Home or Android 5.1 thanks to the SwitchNow app, a product by American Megatrends which is based on the AMIDuOs solution. In use, our first disappointment came when testing the download speed. It reached a puny 15Mbps on a 50Mbps Virgin Media broadband line using the popular fast.com test; that compares very poorly with the 50Mbps reached on the benchmark PC. Then there’s the fact that although the device is dual-boot, once we updated Android, we could no longer boot to it. The HiBox ended up stuck in a loop unless we actively chose Windows when prompted. If you can live with these two bugbears, then the product largely lives up to expectations. Unlike most of its rivals, the HiBox doesn’t come with a pre-activated version of Windows 10. On the performance front, the PC acquitted itself pretty much as expected. It reached 534 and 1138 on Passmark and Passmark CPU, achieved 266 and 953 on CPU-Z in single and multi-thread respectively, 918 and 2040 on Geekbench single and multi-core, along with scores of 10.15 and 103.30 on Cinebench OpenGL and CPU. Read/write speeds were above average topping 136.8Mbps and 88.01Mbps according to CrystalDiskMark. The numbers are slightly higher than the Mini PC based on the older Z8300 system-on-a-chip, with the video subsystem having received more significant upgrades compared to the CPU. 4K on HDMI is possible even at 30Hz and the GPU can handle it with relative ease. There’s plenty of competition at this price point: The Vorke V1, Nexbox T9, Onda M2, the Beelink BT7 and Voyo V3 Mini PCs are all vying for your custom, and are all well-suited for a small business environment because of their price and low maintenance demands. Other than being more affordable than its rivals, what sets the HiBox apart from the rest of the competition is primarily the fact that it can dual-boot to Android – which can prove very useful if it works. There’s also that very nice remote control that can be handy for digital signage purposes. If Chuwi manages to solve the Android issue then the HiBox will be near the top of our list. As it stands though, the uncertainty about updates – Lollipop is nearly two-years-old – makes it difficult to recommend if you wish to use it primarily for Android, especially after what we experienced. As a Windows-only device, the HiBox is a perfectly formed pint-sized personal computer, fully prepared for a SOHO/SMB environment. There are enough ports to keep us happy and its price makes this one of the cheapest PCs around to feature 4GB of memory and 64GB of storage. Add the fact that it runs on a non-registered Windows 10 version (at last) and has a newer Intel Atom processor, and it’s easy to see why this is an appealing device for potential SMB customers.